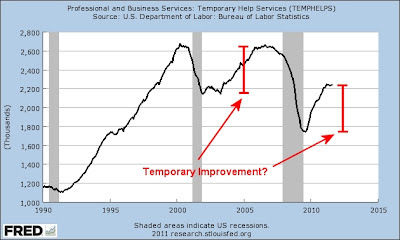 Temporary Help for Temporary Help? 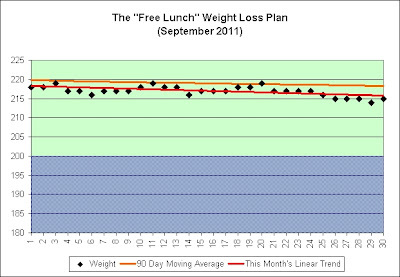 I've added a 90 day moving average to the chart. I'm pleased as long as I stay about a pound below it. That would mean that I'm losing a pound every 45 days and would reach my goal within the time frame of the following chart. I continue to be well ahead of schedule. On September 5th I managed to climb the 20 flights in 3 minutes and 30 seconds. That's a personal best. One might say that I worked out another 5-10 minutes standing there afterwards just breathing, lol. 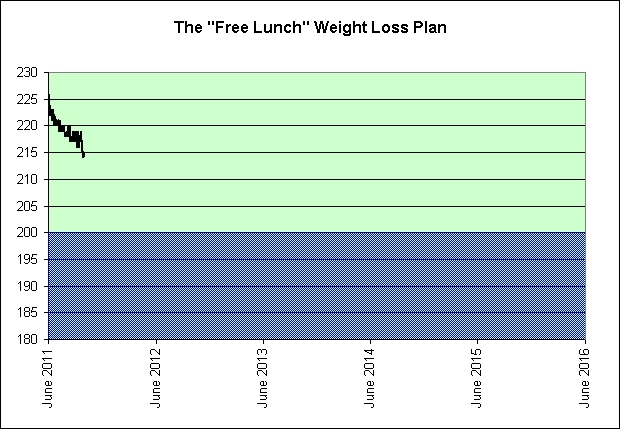 When I started this plan back in June I figured it would take me 4 to 8 minutes each day depending on fitness level and mood. I'm coming in under 5 minutes most days and my overall energy level continues to improve. Climbing a minimum of 20 flights each day has definitely become a permanent habit. 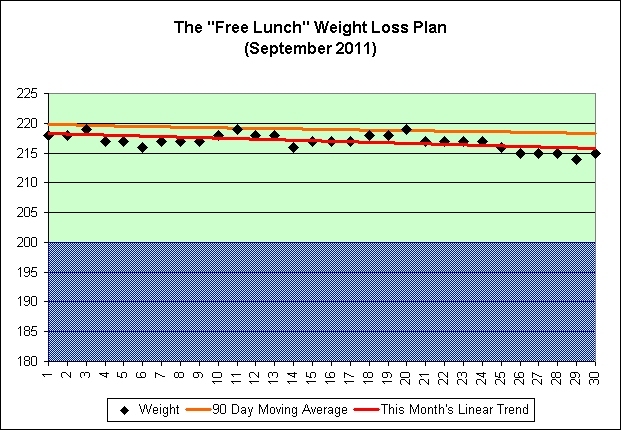 I'm inching my way to the weight loss goal and intend to stay there once I arrive. No more yo-yoing. It has been 4 months. If I had only climbed the 20 flights each day then I would still have climbed 24,400 feet of vertical (nearly 5 miles straight up). The baby steps do add up. 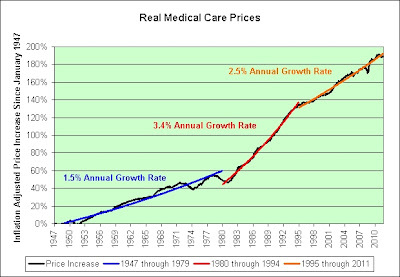 I have adjusted the medical care price index by the consumer price index to show how much medical care prices have increased in real inflation adjusted terms since 1947. This doesn't even count the increased costs as we age. 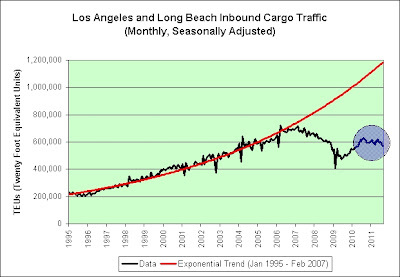 These exponential trends are clearly not sustainable over the long-term. As seen in the chart, the most egregious increases were between 1980 and 1994. I therefore offer an especially sarcastic thank you to Ronald Reagan and George H. W. Bush. The new 1,050,000-square-foot (98,000 m2) hospital is named after the late President of the United States and Governor of California Ronald Reagan. The hospital will contain fewer patient beds (525) than the one it replaces. That works out to exactly 2,000 square feet per bed. When we've got prosperity to burn, stick with nice round numbers apparently. Further, 2,001 square feet would have seemed extravagant. 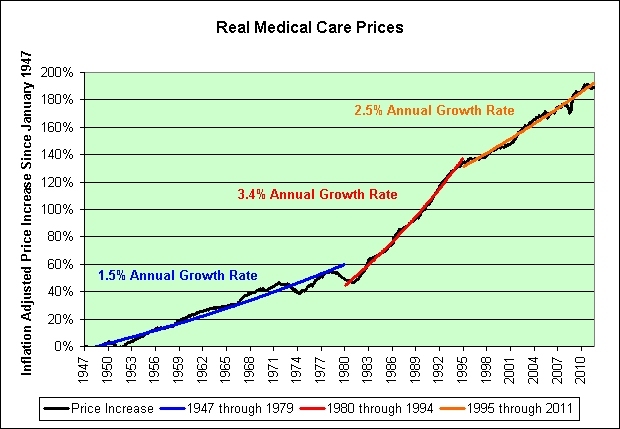 This post inspired by AllanF who thought I might want to do a preemptive post on the eventual failure of the exponential healthcare spending curve. This is yet another exponential trend failure. Further damage from lower rates is likely despite the fact that some closely watched rates, like the yield on the 10-year Treasury note, are already at historically low levels. These exponential trends are not our friends. That's not it. It failed in the 1970s. That's not it either. It failed in the 1990s. CenturyLink sent me junk mail today. WITH AN INTERNET ENGINEERED TO DO JUST ABOUT EVERYTHING and a low price guaranteed for 5 years, why wait? Perhaps the answer can be found in the fine print. CenturyLink may change, cancel, or substitute offers and services including Locked-In Offer or vary them by service area, at its sole discretion without notice. 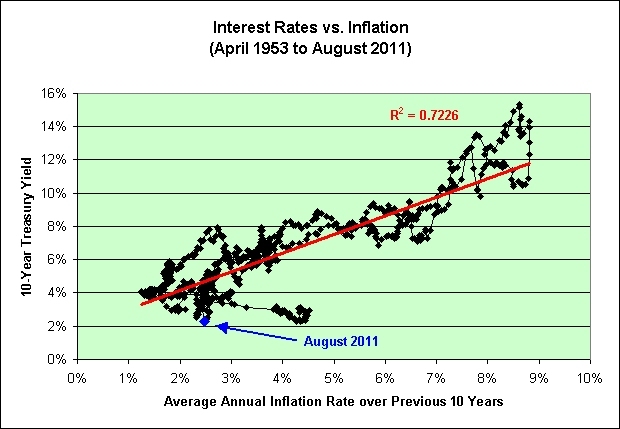 The following chart compares the 10-year treasury yield to the average inflation rate over the previous 10 years. It is a rear view mirror looking mechanism. It assumes investors look to the past to determine what yields should be now. As seen in the high correlation, the assumed "rear view mirror" model seems fairly reasonable. Here's another way to look at that same data. 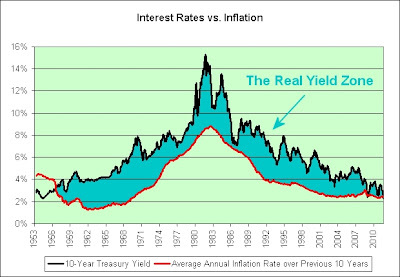 The real yield zone is therefore the difference between the two rates. Let's look directly at that difference in the next chart. 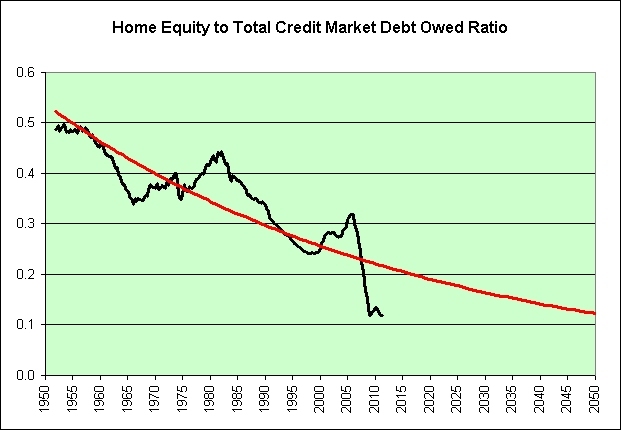 It isn't just interest rates that have fallen since the early 1980s. 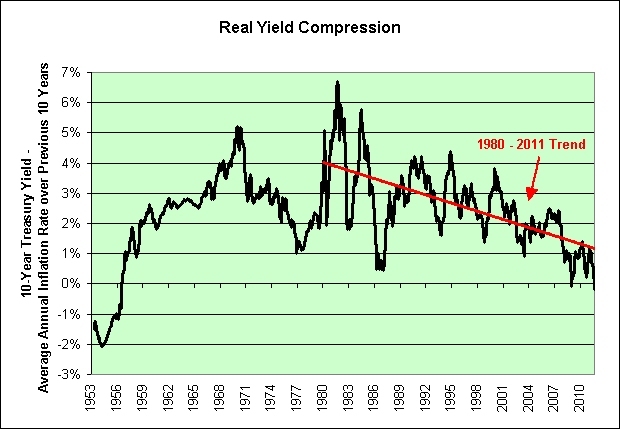 Real yields have fallen too. It is becoming increasingly difficult to make money off of money. That's been a theme of mine since 2000 (and especially so since 2004). This supposedly safe short-term TIPS bond was down 0.45% today as short-term deflationary pressures appeared. This supposedly unsafe long-term TIPS bond was up 1.92% today as long-term growth expectations experienced yet another whack-a-mole event. I propose that Operation Twist be renamed Operation Twister. I'm basing this on Wednesday's stock market action (decidedly negative) and the current stock market futures (decidedly negative). By falling below 1200 on the S&P 500, we have also reset the Rubicon condition. Shocking! I thought for sure that 1200 would hold that time. In case you didn't know, it's an alarm! You're not on a pleasure cruise! The over-the-top game play kicks in at 1:10. Take a dump on the face of common sense! It's unreal yet it's totally real! Disgaea promises to let you develop your own clean and prosperous nation! World's most cost-efficient performance! Limitless random dungeons! Play however many times and hours you want! The strategy RPG that's easy on your wallet! Don't worry my scared little sheep! I did my part to support our Internet economy (Amazon.com) today. Free super saver shipping. No gasoline expended at my end. Sorry strip malls! Disclosure: I've played Disgaea 3 for hundreds of hours. It is one of my favorite games on the PS3. That said, the game is a turn based tactical/strategic RPG and is therefore not for everyone. While Operation Twist was widely expected, the MBS announcement was a bit of a surprise, as was the timing of the Fed's announcement, some 10 minutes after its normal 2:15 ET release. The Fed's failure to meet its (self-imposed) deadline is "very unusual," Olson says, suggesting there was likely some last-minute wrangling over the wording of the release. Ben Stein's famous monotonic lecture about the Hawley-Smoot Tariff Act was not originally in Hughes's script. Stein, by happenstance, was lecturing off-camera to the amusement of the student cast. "I was just going to do it off camera, but the student extras laughed so hard when they heard my voice that (Hughes) said do it on camera, improvise, something you know a lot about. When I gave the lecture about supply side economics, I thought they were applauding. Everybody on the set applauded. I thought they were applauding because they had learned something about supply side economics. But they were applauding because they thought I was boring...It was the best day of my life," Stein said. "The consumer demand in the prior three quarters wasn't strong enough to overcome another bump in unemployment, rising gas and commodity prices, and low consumer confidence," says Bonnie Riggs, restaurant industry analyst, The NPD Group. "The confidence they had in the latter part of last year and the beginning of this year was eroded by bad economic news." The idea is to offer smaller quantities at more appealing prices. The hope is that they will resonate at a time when unemployment stubbornly sits above 9% and many households are living paycheck-to-paycheck​. It is really nice to see Coca-Cola help out the little guy during this period of great economic uncertainty. Offering smaller more affordable packages is something we all can appreciate. Their move definitely resonates with me. I'm sure that Coca-Cola executives would like to do more but how could they? Dropping prices just isn't an option. They are up against a wall with their razor thin 30% profit margin and their most recent $11.8 billion annual net income. 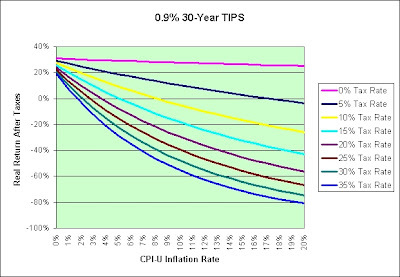 TIPS were introduced in 1997. I've been buying them since 2000. 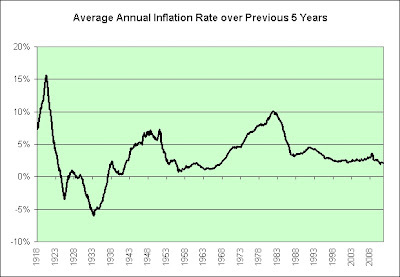 Where's the deflation in the CPI? Where's the hyperinflation in the CPI? 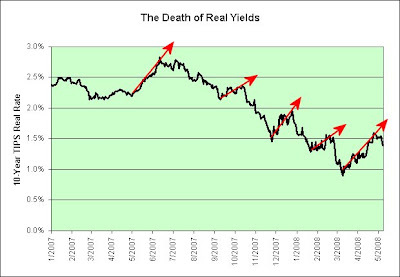 At least so far, this has been a death of real yield story. It has been harder and harder to make money off of money. The 10 year real yield now sits at just 0.09%. 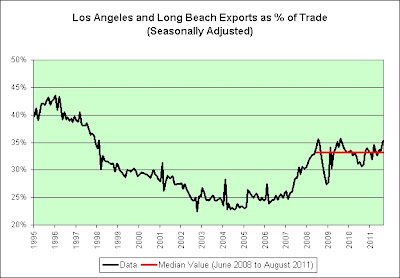 As seen in the link, it fell to -0.03% on September 9, 2011. It literally fell into uncharted territory. That's fear. The last trading day before the 10 year anniversary of 9/11 tends to do that. Are we done being afraid? I somehow kind of doubt it. 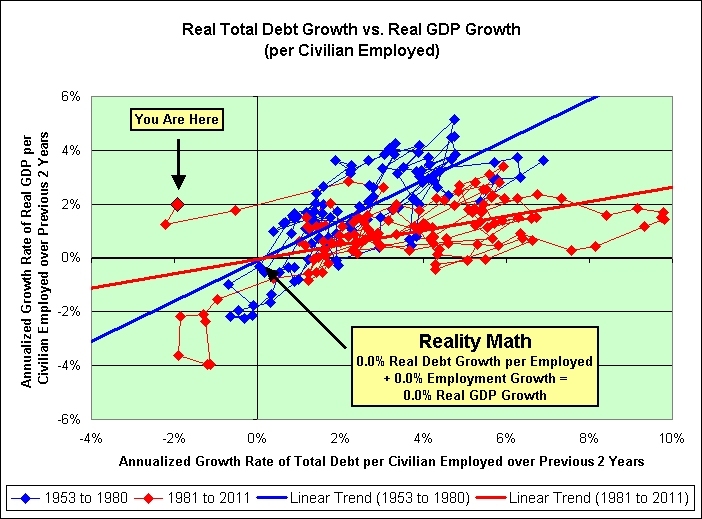 Both data sets clearly show that in order to get positive real GDP growth we must expand the number of workers and/or have each worker take on more and more debt (in inflation adjusted terms). 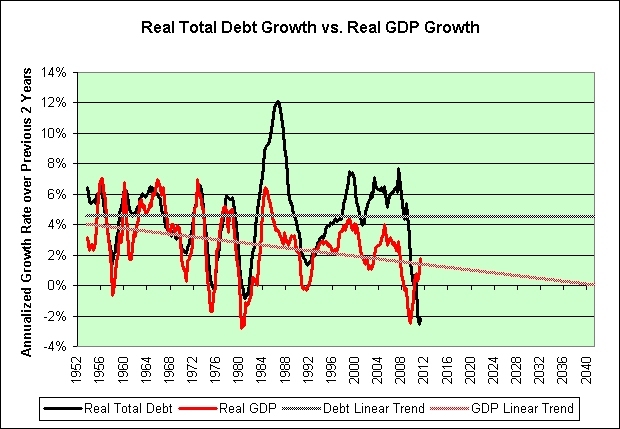 The latter method of boosting real GDP is not sustainable over the long-term. We are currently finding that out the hard way. 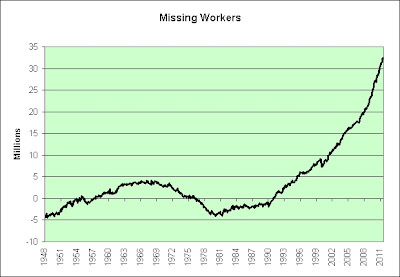 I expect the "You Are Here" point to eventually return to the trend line. There will be more pain if/when it does. 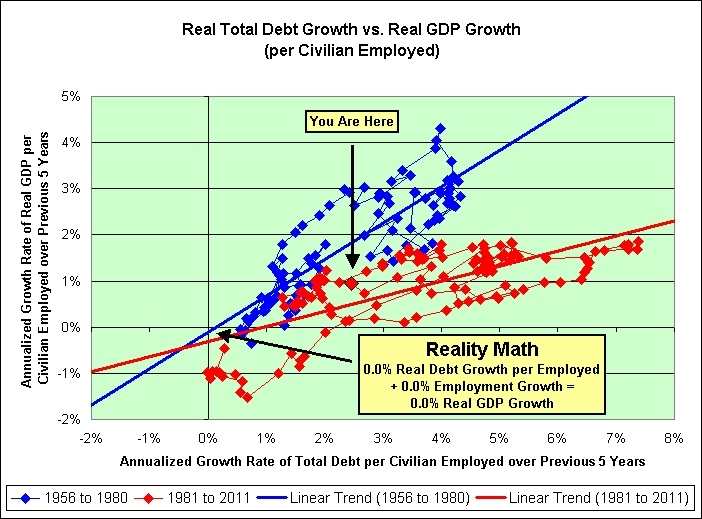 Note that it took more debt growth from 1980 on to get the same level of GDP growth that we saw before 1980 (as is seen in the difference in slopes between the two trend lines). 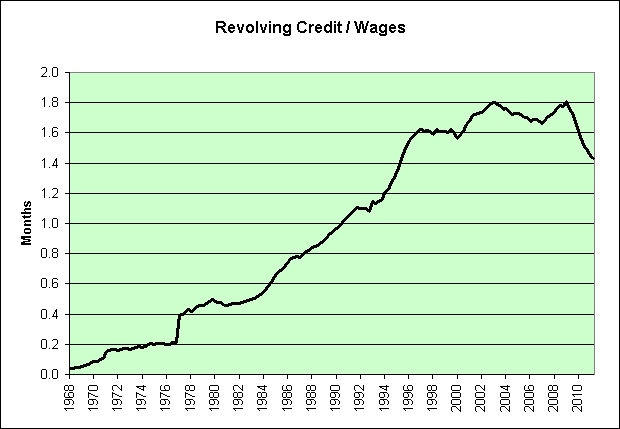 In other words, we're getting progressively less bang for our debt buck. 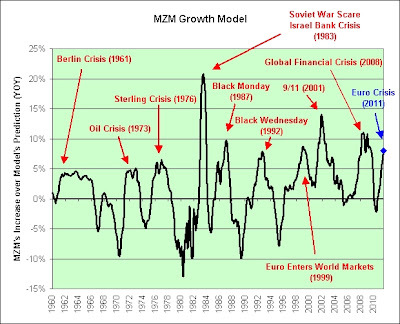 I am more bearish now than I was when I first turned bearish in 2004. 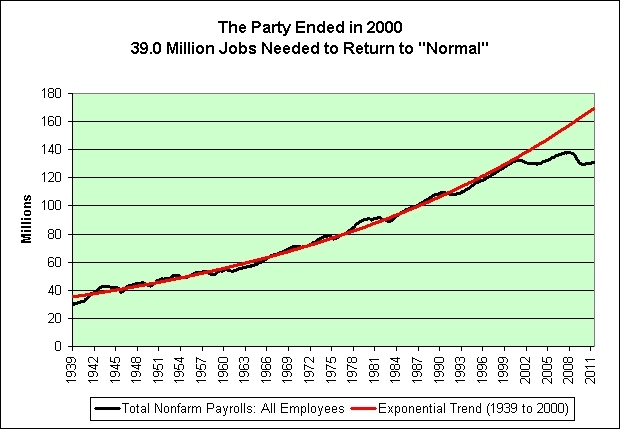 Just once I'd like to find a chart that offers a bit of "real" long-term hope. Picosec pointed out that the correlation was rather low. I increased the time frame to 5 years to remove some of the random noise. It still looks a bit noisy, but keep in mind that this chart is not on the same scale as the last one. I was able to zoom in a bit to show more detail. 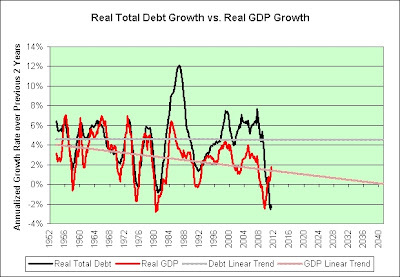 The r-squared for the blue line is now a respectable 0.73 (up from 0.58 in the first chart) and for the red line it is now 0.56 (up from 0.29 in the first chart). First of all, the data covers through the end of June. Anything since that time is not included. The black line shows bank deposits plus credit market assets (treasuries, savings bonds, corporate bonds, and so on) minus credit market liabilities (home mortgages, consumer credit, and so on). 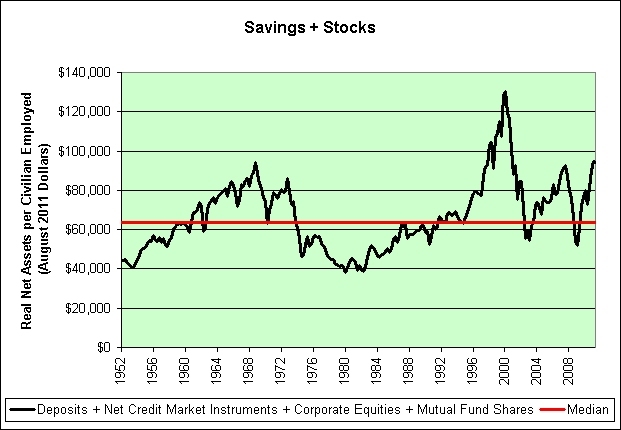 The red line shows the market value of corporate equities and mutual funds. 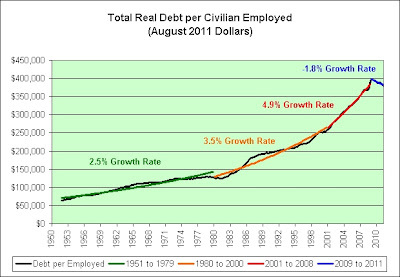 I've also adjusted both values for civilian employment growth and inflation (August 2011 dollars). 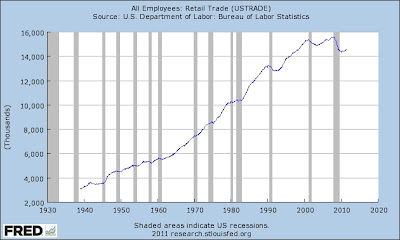 Just look at that divergence starting in the early 1980s. Someone apparently got the idea that the stock market was always a sure thing. 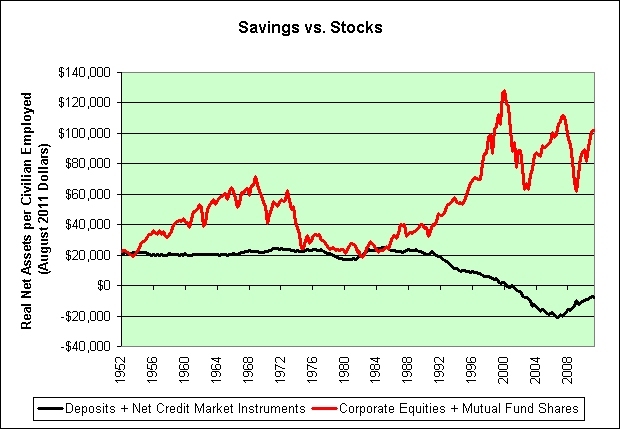 Jeremy Siegel seems to think corporate equities and mutual funds are still a bargain and that savings are in a bubble. I don't think the chart offers much support for that theory. As for me, I'm kind of expecting the black and red lines to meet up again someday. That's especially true if baby boomers retire and wish to convert stock market profits back into savings, much like I have done. What are the odds of that though? 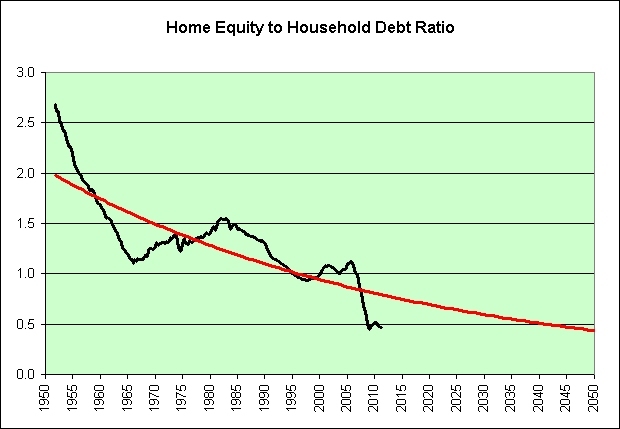 Disclosure: My nest egg sits on the black line. 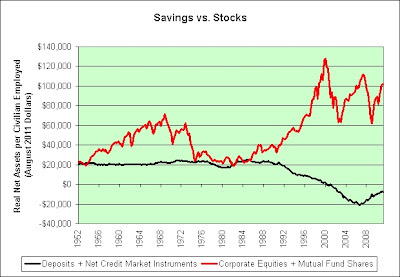 I own no corporate equities or mutual funds and it is unlikely that I ever will again. 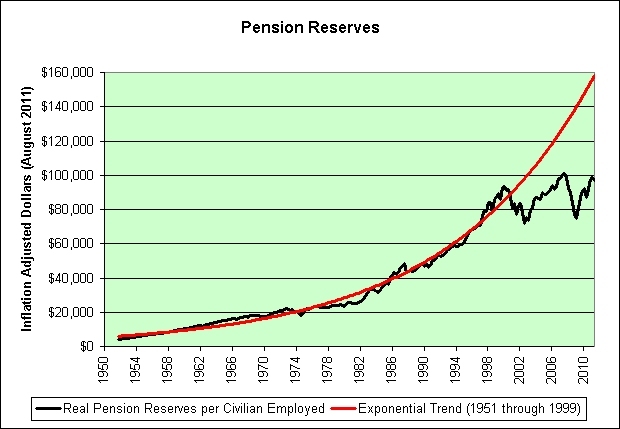 This chart shows the sum of the two values and compares it to the long-term median value. Hey! Look how rich we are even as our economy struggles! I'm sure we'll never return to the median again. It's nothing but real prosperity from here on out. No more illusions! In all seriousness, both of these charts tell me that as of the end of the second quarter we were back to bubble popping levels. The S&P 500 is down about 8% since then. Some of it is now priced in. But how much? Just opinions. Be careful out there. This is not investment advice. Aging baby boomers may hold down U.S. stock values for the next two decades as they sell their investments to finance retirement, according to researchers from the Federal Reserve Bank of San Francisco. Good grief. He never gives up. Fourth-quarter profit at Citigroup nearly doubled on the strength of its credit card business and lower litigation costs. 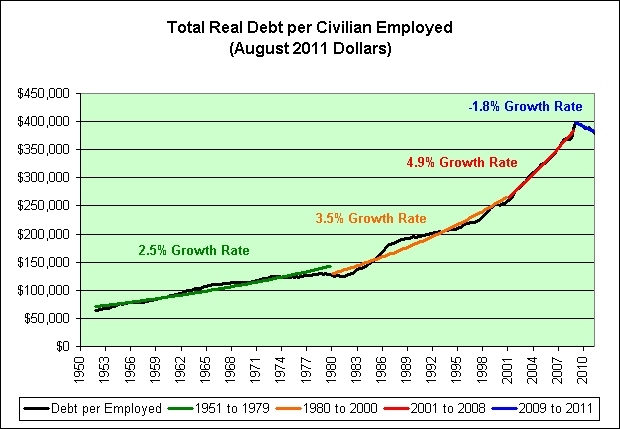 The following chart shows the total credit market debt owed per civilian employed (adjusted for inflation, August 2011 dollars). 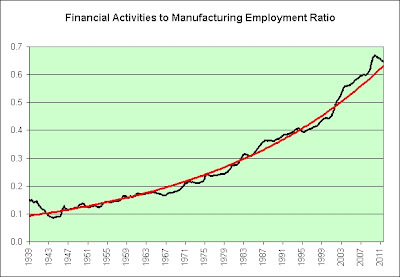 The "lifeblood" of our economy continues to drain. Perhaps we pumped way too much into it. 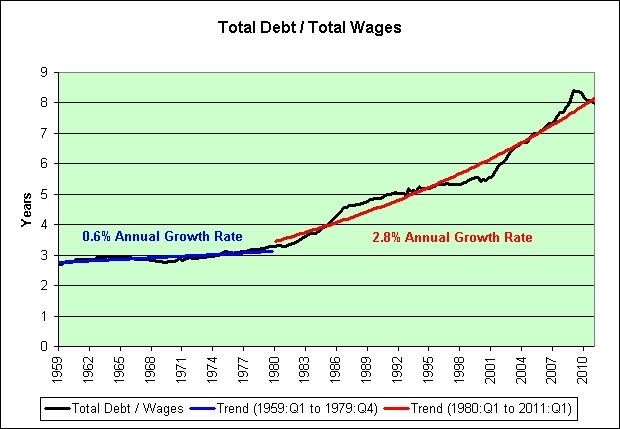 The following chart shows wage and salary disbursements as a percentage of GDP. 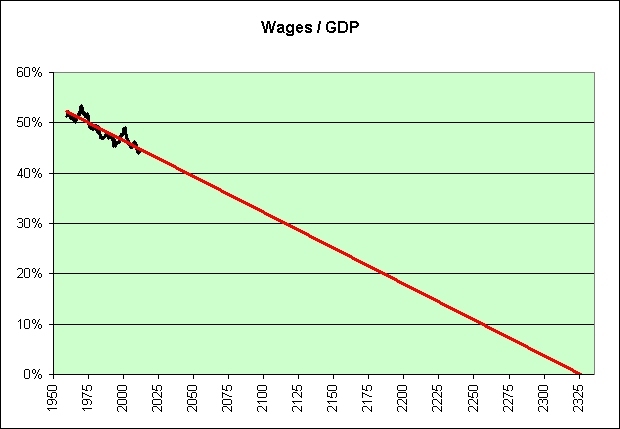 I've added a trend line to show where we are headed. Do not be discouraged by the 2325 target date. 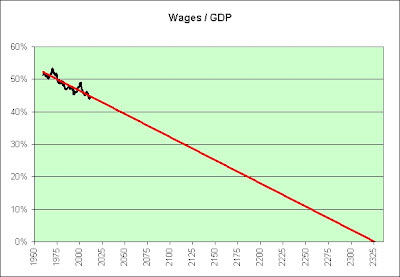 If we're really smart, then I believe we can actually reduce wages to zero well ahead of schedule. This post inspired by Troy's comments. This post inspired by this post at Retirement Blues. Skimming across the sea like a bird on a wing. 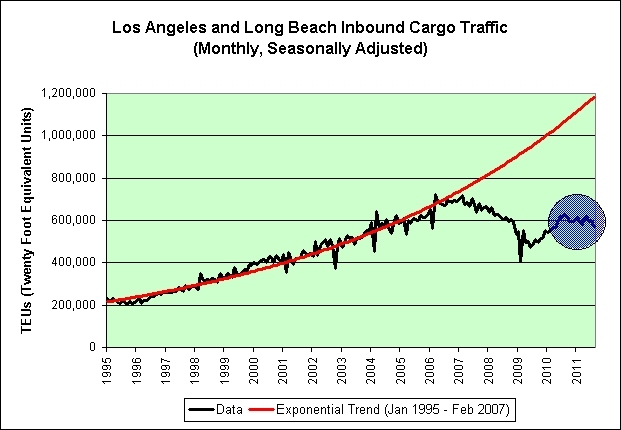 Inbound traffic does not imply that there will be a strong Christmas season. 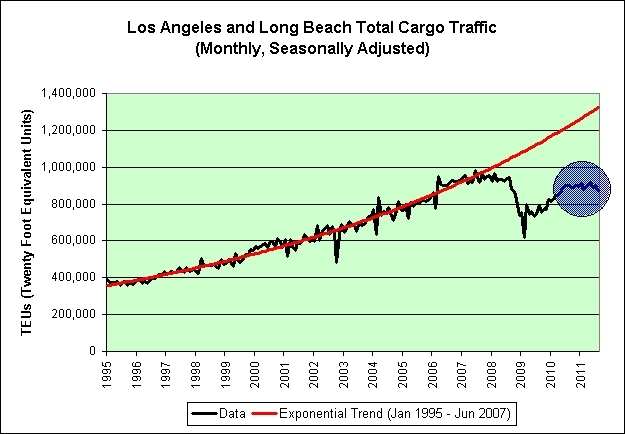 Adjusted for seasonality, August was an absolutely awful month (down a whopping 33,000 containers from July). Outbound traffic is attempting to move higher. Just like it did in 2007? 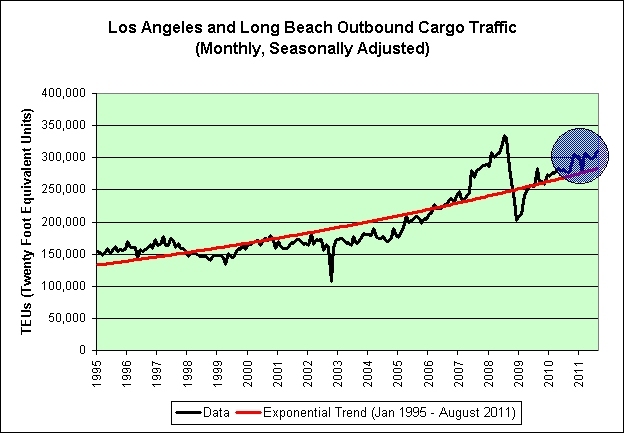 Total port traffic is really struggling. 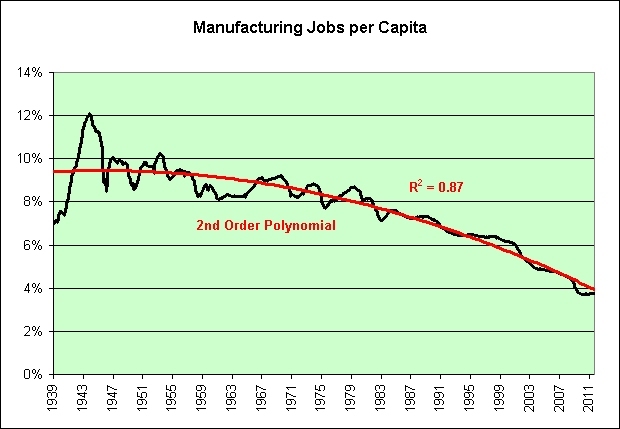 I see no hope of ever returning to the red trend line. 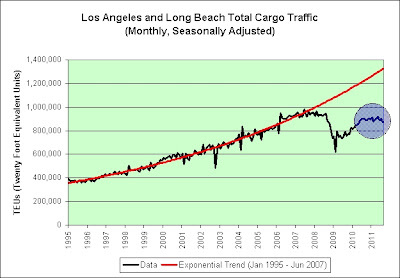 Much like the other exponential trend failures I've posted on this blog, we continue to drift further and further away. 35% better not be yet another rubicon level, because this is not the first time we've crossed it. 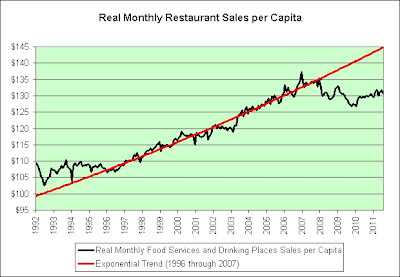 The following chart compares restaurant sales to all food and beverage sales. 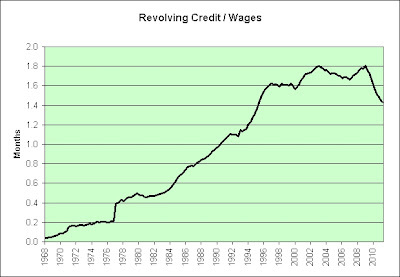 This ratio peaked in December 2006 at 45.27%. In August we hit 43.98%. Another month, another month of pain. 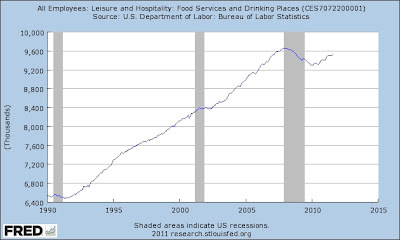 In my opinion, short of subsidizing the restaurant industry with more money/credit we do not have, there is nothing the government can do to prevent the ongoing decline. It has already thrown the kitchen sink at it. What's left? Now picture what would happen if the ratio dropped to what it was before the fake prosperity of the dotcom and housing bubbles. Ouch. Wow. This really does work. I'm not at all worried now. 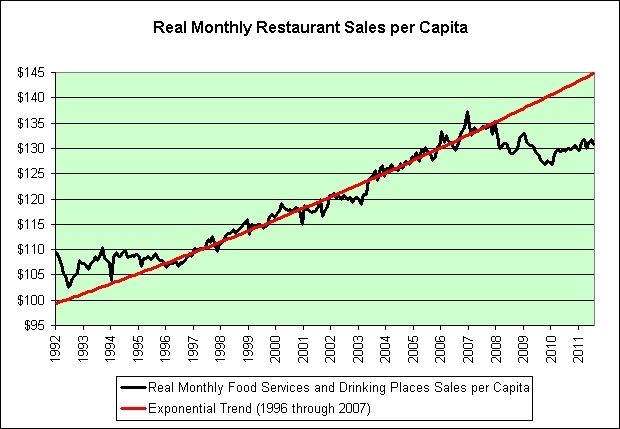 I believe that we may eventually see inflation adjusted restaurant sales per capita fall to 1996 levels (or worse). 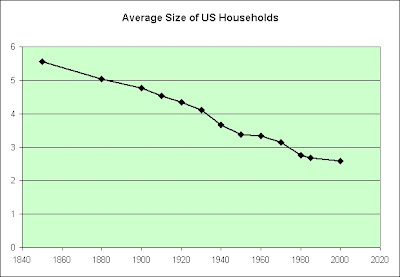 As we felt more prosperous, we ate out more. 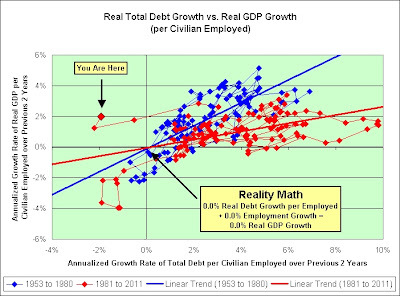 That prosperity was based on stock market, housing market, and credit bubbles though. It was an illusion. 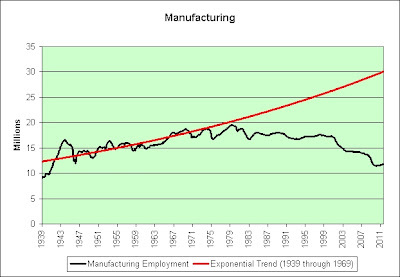 In any event, I strongly believe that there is zero chance that we will ever return to the red exponential trend line established between 1996 and 2007. That trend has failed and there is no going back. Each month we drift further and further away. 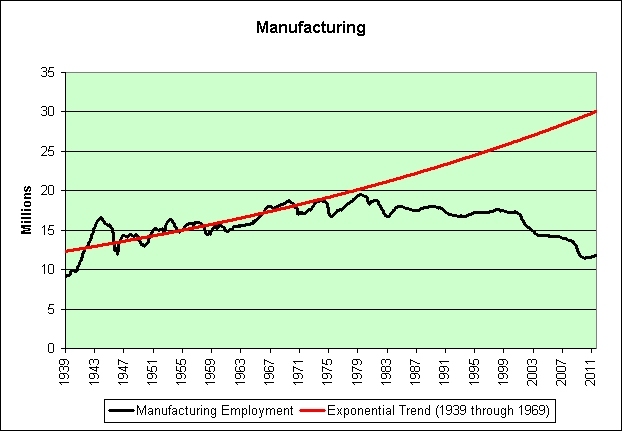 It is just one of many exponential trend failures that we've seen over the last decade. I doubt it will be the last. 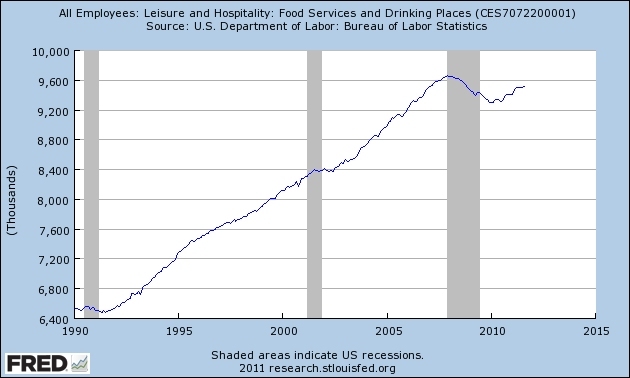 I therefore continue to be bearish on our restaurant industry and the 9.5 million jobs found within it. Before pain hit the housing market we were told that people always need a place to live. In hindsight, people can be fairly creative. We are told that people also always need to eat. The fast food industry is now attempting to be equally creative. Go figure. This is not investment advice. 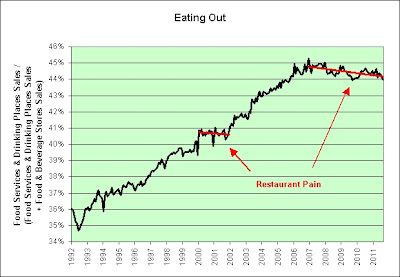 I am not shorting the restaurant industry. I'm simply an observer hoping to partially avoid the ongoing carnage. It is a shame that a $28.84 hourly wage is no longer enough to bribe an elected official once per month. Where is Boss Hogg when we need him? I had no idea that I needed 35% more. That's what the research shows. I must be doing something wrong. About the same as I did when I was working, but without the commute? Most of all, just enjoy the free time I guess. Same place I lived when I was working? Now that I don't have a job, I could probably move to someplace cheaper I suppose. No hurry on that. I like where I live. Same things I was doing when I was working, only without the work? For example, playing with the dog on the front lawn is great fun. I was skeptical, but the 35% rule does seem to apply even to dog playing. Who knew? Democratic and Republican leaders of the Senate and House Budget Committees agree that a stimulus should be temporary and should not push up long-term interest rates. Finally, any program should be explicitly temporary. I stumbled upon a post today and I just have to share it for any computer programmers out there. But before I do, let me offer my opinion of the C++ programming language. I love it and I do not know what I would have done without it. In the right hands, C++ can be a wonderful tool. It allows one to gather one's thoughts in small manageable pieces and build those pieces into a large complex structured system. In the wrong hands, C++ will give a person more than enough rope to hang. So that being said, I'll leave it for you to decide if the following hands were the right hands. I had my Computer exam today and we had 2 1/2 hours to write a monster program and I finished mine in an hour and a half but the stupid thing was giving me errors and I couldn't figure out what the error was because the dumb program was running but it was giving me four zeros as the output and it was so bloody frustrating and I was soo irritated and I went through my code step by step like 400 times but I couldn't find the damn error. That's just one sentence. Take a breath. And then I felt like crying cause I was so frustrated and I didn't know what to do. You need to take a very deep breath now. Trust me on this. You'll need it. So I considered giving up but my computer teacher said he wouldn't let me go home until I fixed that program because he had very high expectations and everyone else finished and walked off and he delayed the next batch of people coming in because he said I needed to fix the error so I sat there trying to fix the error and then I thought I had found the solution so I changed the code but all that changed was the dumb program gave me five zeros instead of four zeros and my only consolation was that the five zeros were very neatly presented and so again I had to trawl through my code to find my mistake and I thought the dumb compiler was messed up because by that time I had gone through my code a thousand times and I went through it again before asking my teacher if he could grade me on what I'd written but he said no and he made me sit down again and I was so sad. All that information was packed into just one sentence. Note that the "and" to "." ratio is 10 to 1. Amazing. I'm really not trying to be mean here or pick on this individual. 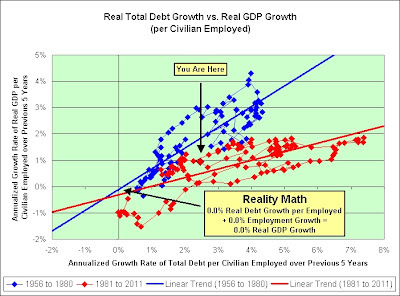 Ben Bernanke thinks we just need to work smarter. I'm simply questioning whether the average American can work smarter than the average worker if every worker gets a college degree. In physics, a 2nd order polynomial can exactly represent the path of an object if gravitation is the only force being applied to it. Picture a baseball falling back to the earth after being hit by a bat (assuming negligible air friction). 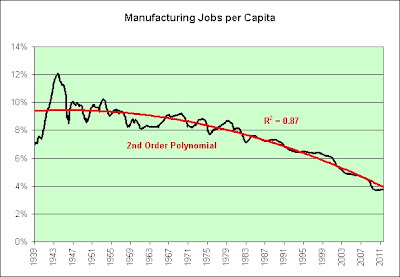 Now consider the path of manufacturing jobs. We should be concerned that the path of manufacturing jobs is behaving as a baseball would even as our population continues to grow. The following is what it looks like if we adjust for that population growth. 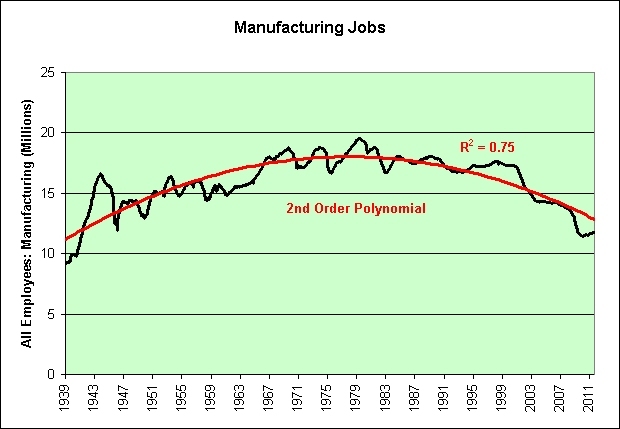 Manufacturing jobs are not just in decline. It is worse than that. The losses are/were accelerating. 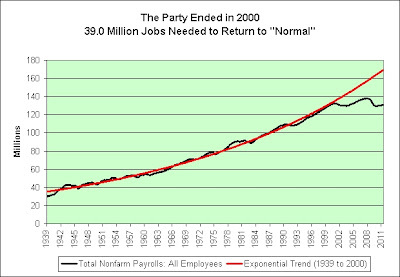 First "they" came for our farming jobs (think non-farm payrolls). We said nothing. Who doesn't like cheaper food? 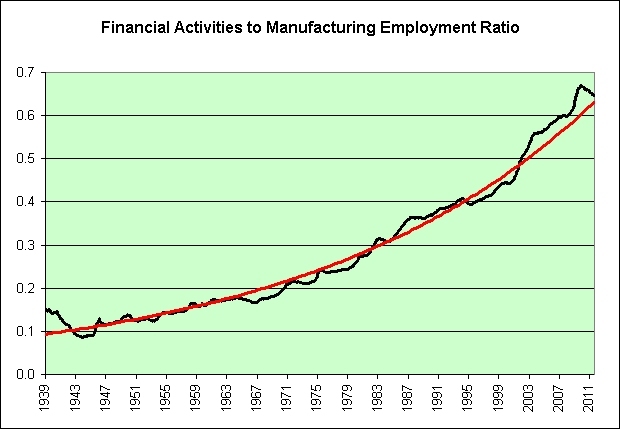 Then "they" came for our manufacturing jobs. We said nothing. Who doesn't like cheaper products? 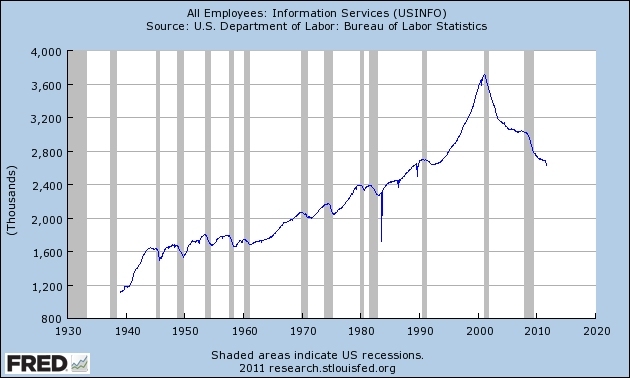 Then "they" came for our information services jobs. We said nothing. We knew there was a dotcom bubble. 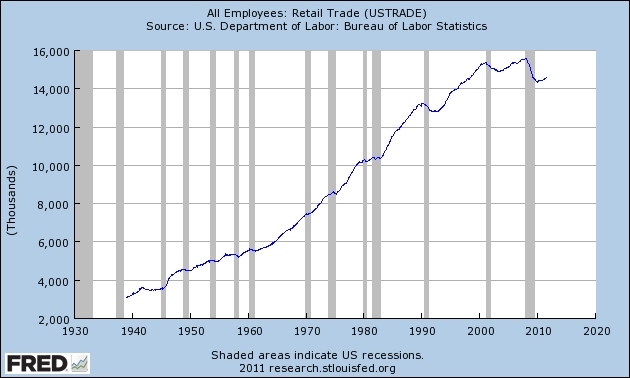 Then "they" came for our retail trade jobs. We said nothing. We embrace Amazon.com. We embrace Costco. We embrace self-service checkout lines. 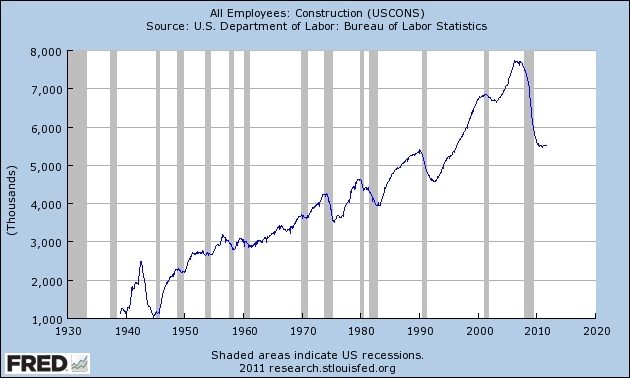 Then "they" came for our construction jobs. We said nothing. 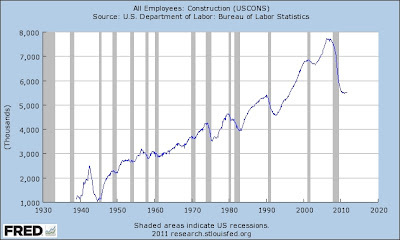 Housing was overbuilt. We knew that. It was inevitable. 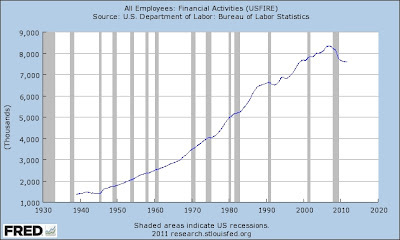 Now "they" come for our financial activities jobs. We say nothing. 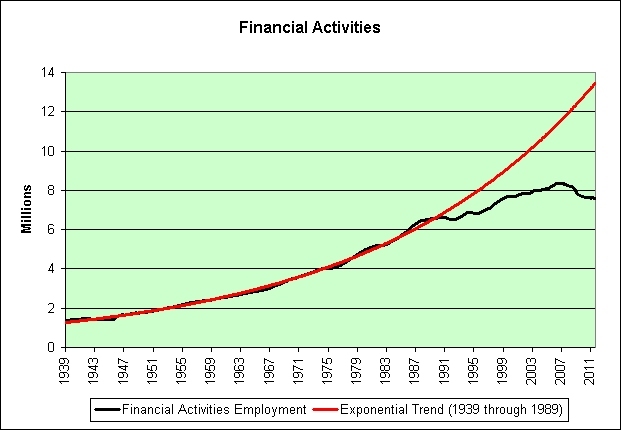 We simply look in horror at what financial activities have done to us. Major global banks have been jettisoning workers en masse for the past few months – the brutal manifestation of a grim new economic landscape. According to Bloomberg, the fifty largest global banks have announced nearly 60,000 job cuts this year, the fastest pace since the recession-plagued year of 2008. As the economy in the US and Western Europe stagnates, banks have to reduce costs to become profitable. "First they came…" is a famous statement attributed to pastor Martin Niemöller (1892–1984) about the inactivity of German intellectuals following the Nazi rise to power and the purging of their chosen targets, group after group. Longview Police Chief Jim Duscha says six guards were held hostage for a couple of hours after 500 or more Longshoremen broke down gates about 4:30 a.m. and smashed windows in the guard shack. He says no one was hurt and nobody has been arrested. “We are obviously thrilled with the election results, but more importantly are delighted that the transportation security officers now will have the full union representation they rightly deserve,” said John Gage, the president of A.F.G.E. To me that's a recipe not for an explosion upward but for a range where Europe kills us one day but we are brought back to life by China and by broader trends that won't quit, trends including better-than-expected​ earnings on top of lowered estimates and the gloom that shrouds all. Europe kills us and then we are brought back to life by China? Seriously? And if there is one way to describe Zombieland, it is moist. There are all sorts of unwanted fluids (liquidity) everywhere. Broader trends that won't quit? “I’ve always enjoyed my customers, but some things have been happening over the past 2 to 3 years that just led to closing it. I’m actually happy about it. I’ve been kinda’ sick ... and I can’t take it no more,” Corbin said. “We’ve got a buyer for it, but the restaurant will be gone. They’ll be tearing the building down,” he said. Perhaps a presidential pep talk will inspire him to change his mind? The following chart shows the increase in prices of various food items since 1947 relative to what prices overall have done. 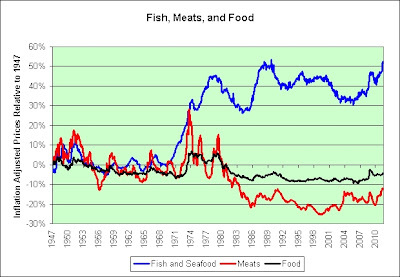 I find it interesting that fish and seafood prices rose during the 1970s relative to most things and never came back down. The same cannot be said of meats. In anticipation of this post, fried has offered the following link (from the comments of the last post). For what it is worth, I have a very large supply of canned tuna fish in my extended pantry. Unlike meats, it does not even require refrigeration. That said, all is not lost perhaps. Japan has spent decades developing and refining highly advanced fish-farming techniques. In September 2004 many of those efforts came to fruition when the first consignment ever of farmed bluefin tuna, a fish that fetches extremely high prices, was shipped commercially. In a related development, a major supermarket has announced plans to sell flounder that has been farmed without the use of antibiotics. The technology of fish farming, a practice that offers advantages in terms of food safety and conservation, is advancing rapidly. Aquaculture continues to be the fastest-growing animal-food-producing sector and to outpace population growth, with per capita supply from aquaculture increasing from 0.7 kg in 1970 to 7.8 kg in 2008, an average annual growth rate of 6.6 percent. iShares Barclays TIPS Bond Fund (NYSE:TIP) defies analysts with a current price ($115.85) 100.0% above its average consensus price target of $0.00. Yes, indeed. Even if TIP currently traded at a penny it would infinitely defy the analysts, lol. Now I'm not suggesting that TIP couldn't fall from here. It definitely could. I have chosen to park money in an online savings account rather than risk parking it in the fund (for money I need in the next few years). That said, there is clearly an error in the analysis. The author of this article did not find a $0.00 consensus price target to be even a bit odd? How is that possible? It is a sardonic comment on the tendency to put excessive trust in "computerized" data, and on the propensity for individuals to blindly accept what the computer says. Because the data goes through the computer, people tend to believe it. In my opinion, this term also describes our banking system fairly well. Banks tell their computers that the assets on bank balance sheets are pristine and proper and then the computers inform us that the assets on bank balance sheets are pristine and proper. Garbage in, garbage out. There's a lot that could be said about this chart. Rising income inequality? China dumping their goods on us for our money? The tanking real estate market? 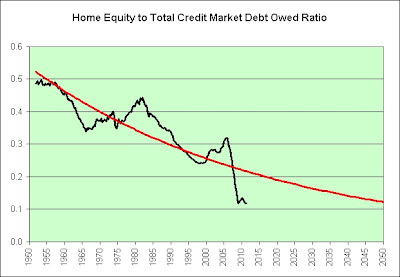 Our credit bubble? 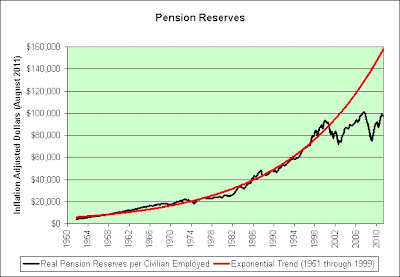 Financial repression? I don't think the treasury bull market will last forever, but predicting its demise has been a bit tricky to say the least. Never a better time to short treasuries? Oops. I was rather indifferent personally. 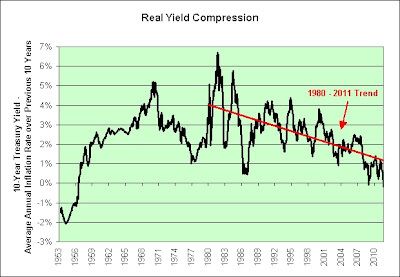 I thought real yields would continue to fall and they have (just like the 1970s). I had little opinion on nominal yields though. 1970s? Japan? You tell me and we'll both know. 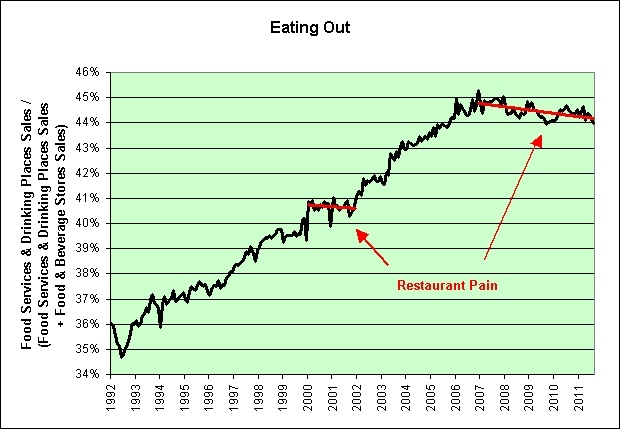 Those buying and holding today's 10-year 0.0% TIPS will lose purchasing power after taxes. If the bull market continues it sure won't feel like it. That said, take a look at global short-term real yields as seen in the chart in the following link though. You could potentially do worse. A look at average real short-term policy rates over the past 15 years shows how extraordinary the current environment is (see Chart 1). By this metric, the entire world is, on average, running a very repressive interest rate policy. Even the majority of emerging market countries are holding rates abnormally low compared with inflation and growth trajectories. I'm about out of "safe" advice for the constitutional saving peasants. We're being oppressed. 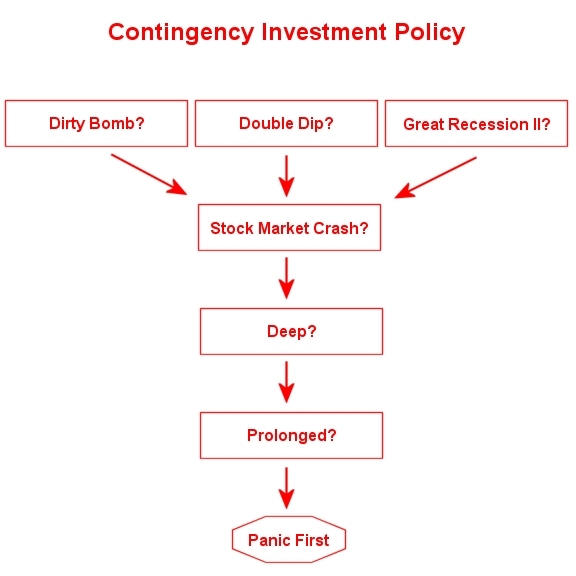 The central banks of the world are desperately attempting to get us to embrace risk at exponentially increasing levels. My idea of risk taking was buying long-term TIPS, I-Bonds, canned goods, and toilet paper on the hopes I would do it before others did. I'm not exactly sure that's what our superiors had in mind. 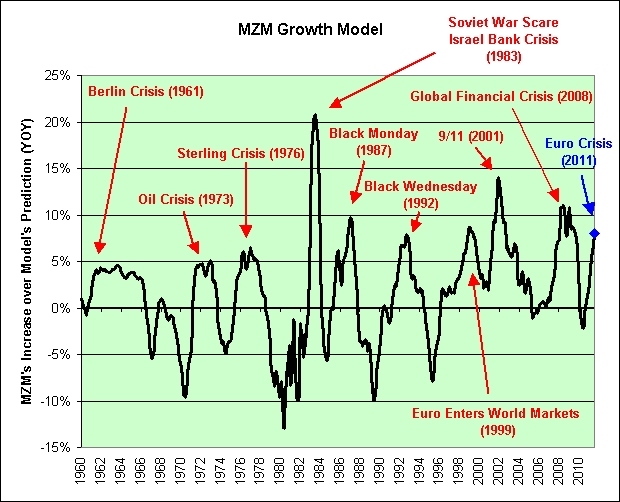 I'm using a crude simplistic model as an attempt to understand the movements of our liquid money supply (MZM). 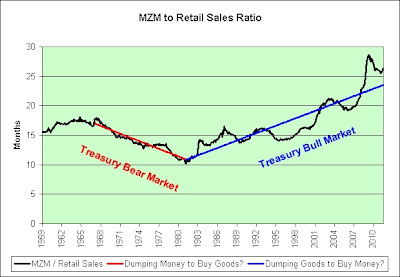 I assume that MZM grows naturally based on the rate of three month treasury bills and use the past 12 months of data to predict where we should currently be (assuming no inflows or outflows). I then compare where we are now to that prediction. Using this model as a guide, investors lacked confidence over the past decade. Can't say I blame them. 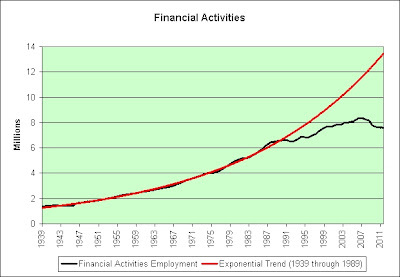 I included some of the more major economic events on the chart. I've no doubt missed quite a few. For example, the Cuban Missile Crisis (1962) was certainly worth mentioning. Although I think gold is in a bubble, a few weeks ago I wrote this post explaining why I thought at least some of gold's price moves were rational. Last night I ran across the following article and my thoughts on it will no doubt amuse the gold bugs. Hey, I'm an equal opportunity heckler. I would define an investment as an asset that creates value and income over time. Stocks, bonds, real estate, even livestock and some machinery for businesses would all qualify. 1. The asset must create value and income over time. 2. Bonds qualify as an investment. 3. TIPS are bonds, therefore TIPS are an investment. 4. The real yield on 5-year TIPS is negative. 5. 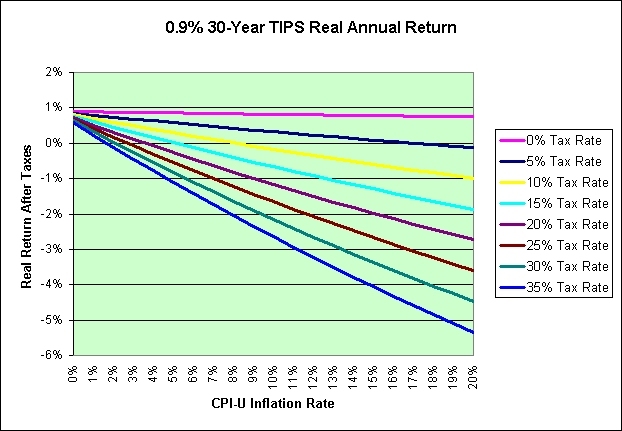 5-year TIPS cannot create value and income over time, therefore 5-year TIPS cannot be an investment. Using this article's own definition of an investment, 5-year TIPS are an investment and are not an investment. Clearly there is a serious logic problem in the author's definition of investment. Don't even get me started on the lack of value creation and income generation of stock and real estate investments since I started this blog. This is an easy one. Is gold a store of value? Absolutely. 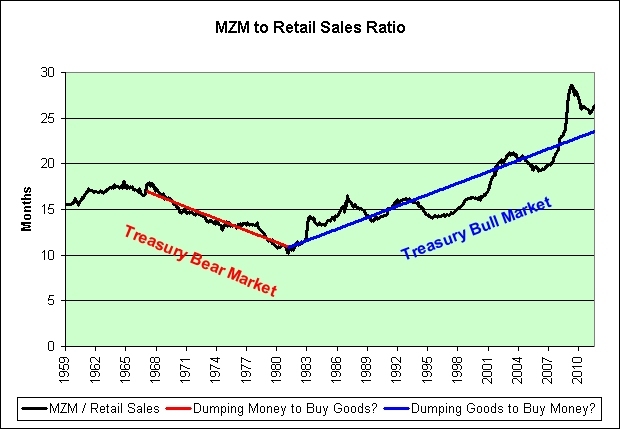 As long as gold doesn't fall to zero dollars then it will store at least some value. Even a cracked glass can be a store of water (as long as you don't fill it above the crack). 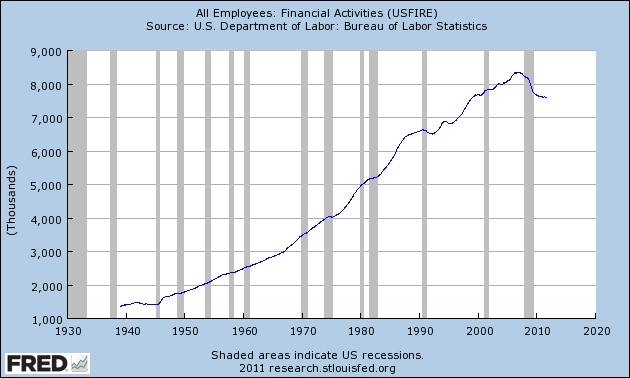 Greenspan said in 1966 that there can be no "safe" store of value in a welfare state. Is gold a safe store of value? No, but nothing is. Is gold a good store of value at these price levels? I don't believe it is over the long-term but I could be wrong. Even if it was the author's intent to suggest that gold is not a good store of value at these prices levels and/or over the long-term, then it is still impossible to bust the myth based solely on personal opinions. This claim is almost laughable, but it wasn’t born in a vacuum. The total market capitalization of all publicly traded companies of the world was thought to be $51.2 trillion in 2007 and just $40 trillion in September 2008. 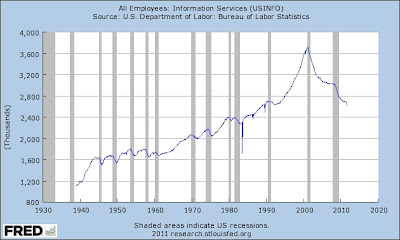 Note the $11.2 trillion decline. The total debt of the world is thought to be $109 trillion in 2010. At $1750 per ounce, the total value of the world's gold is thought to be $9.2 trillion. Gold represents roughly 5.4% of the total ($51.2 trillion + $109 trillion + $9.2 trillion). Further, stocks lost more value from 2007 to 2008 than the value of all the gold that's ever been mined. It could easily happen again. That's not even counting the trillions upon trillions of dollars in global real estate ($18 trillion just in household real estate assets in the US). If one is seriously concerned about the state of the global stock markets, global real estate markets, and global debt markets then I think it could be easily argued that gold is still a contrarian trade. On the one hand, I think gold is mighty expensive compared to toilet paper. I think that is a huge red warning flag. On the other hand, I do not agree with the author's conclusion that the "gold’s bull run is based on weak arguments that don’t hold up to scrutiny." From where I stand, none of his three supposed myths hold up to scrutiny. If holders of long-term treasury inflation protected securities (such as myself) experience serious pain, then hindsight will more than likely show that gold was a bargain even at these levels. The emphasis is on the word "if" though. Only in hindsight will we know for sure. The following chart shows what an investor can expect to earn by buying today's 0.9% 30-year TIPS and holding it until maturity. 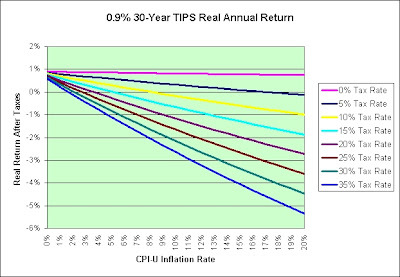 Note what the combination of high inflation rates and high tax rates does to TIPS performance. 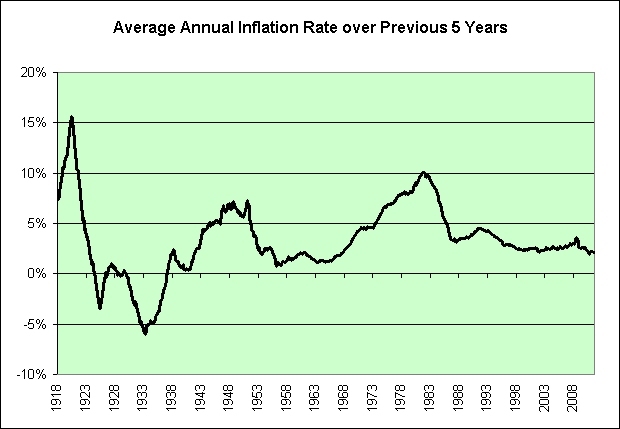 Inflation protected securities offer pretty good protection but only if inflation doesn't get seriously out of hand. Although TIPS investors would be doing much better than nominal treasury investors in such an environment, there would still be pain if inflation picked up (due to the taxation of the inflationary gains each year). The greater the inflation rate, the greater the pain. As a TIPS investor who holds TIPS to maturity, I am fairly well protected against a 1970s style inflationary environment that never ends (7.5% per year inflation). I am not well protected against hyperinflation. Gold investors are much better protected should that happen. The risk is not trivial but it is one I am willing to take. I personally think gold is in a bubble and that it is unsafe to be investing in it at these levels (with the caveat that I don't think anything is safe right now, other than toilet paper and basic necessities). It is just an opinion though. I certainly cannot prove it beyond a reasonable doubt. In other words, if gold was on trial here I would have to find it not guilty. Thanks to Troy for pointing out that the $18 trillion in real estate was just the household real estate assets, not all land value. I should definitely have made that more clear. 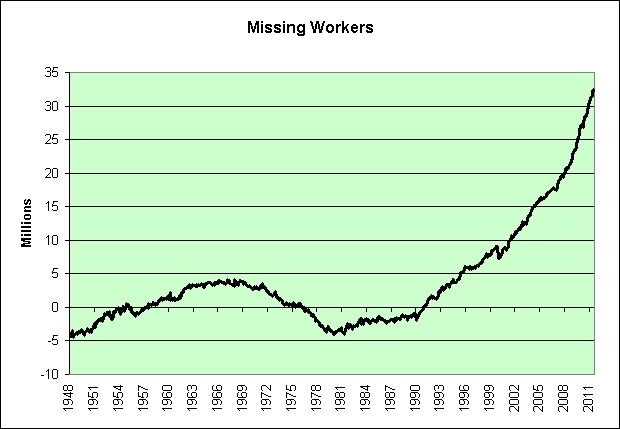 The following chart shows the civilian labor force (those who have jobs or are seeking jobs). 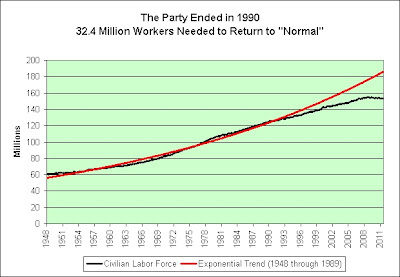 I've included an exponential trend line based on the data from 1948 through 1989. 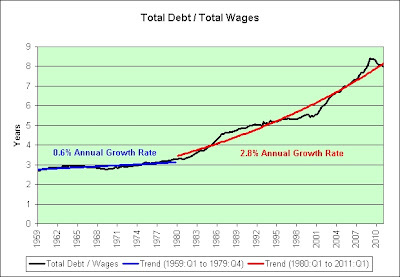 Here's a chart showing the difference between where we are and the trend line. NAFTA is really less about trade than it is about investment. Its principal goal is to protect US companies and investors operating in Mexico. The text of the agreement is contained in two volumes covering more than 1,100 pages. The text is mind-numbingly dull. Large portions of it are written in the type of obscure legal terms found on the back of an insurance policy. Buried in the fine print are provisions that will give away American jobs and radically reduce the sovereignty of the US. 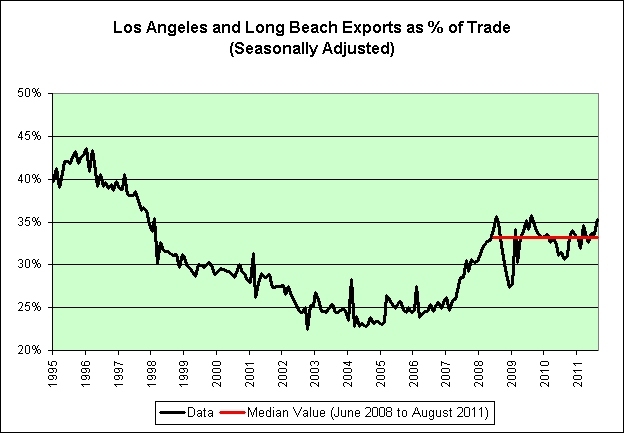 It isn't just the trade deficit that hurts us going forward though. Think demographics.